An Afghan Air Force UH-60 is towed as two AAF A-29s taxi for take-off Sept. 18, 2017, at Kandahar Airfield, Afghanistan. The UH-60 was the first to arrive in Afghanistan as part of modernization efforts to transition the AAF to a more sustainable and modern helicopter fleet. 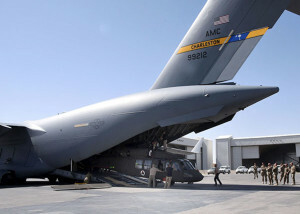 The first two Afghan Air Force UH-60 Blackhawk helicopters have arrived at Kandahar Airfield. The UH-60s are the first to be delivered to the AAF under the Aviation Transition and Modernization program. The plan to modernize and increase the AAF fleet will provide firepower and mobility enabling the Afghan National Defense and Security Forces to bring a decisive advantage to the fight against anti-government forces. The first group of UH-60s will remain at Kandahar Airfield, where flight training for Afghan pilots is slated to begin in October. Air advisers assigned to Train, Advise, Assist Command-Air, 738th Air Expeditionary Advisory Group, will oversee the training program. Over the coming years, additional Blackhawks will be distributed to four primary AAF bases throughout Afghanistan. The UH-60s are just part of the plan to modernize and expand the AAF. Additions to its current fleet will increase strike aircraft numbers from 58 to 173, while its rotary aircraft fleet will increase from 74 to 173. Earlier in this year, the U.S. committed more than $814 million for fiscal year 2017, funded by the U.S. Contingency Operations Afghan Security Forces Fund. The funding will be used to shape and modernize the Afghan fleet over the next several years by procuring UH-60s, with refurbishment and modification of the first 18; additional armed MD-530F helicopters, A-29 attack aircraft and AC-208s aircraft, which will provide Afghan National Defense and Security Forces an advantage on its domestic battlefields. An Afghan Air Force UH-60 is off loaded from a C-17 Globemaster, Sept. 18, 2017, at Kandahar Airfield, Afghanistan. Train, Advise, Assist Command-Air advisors have worked closely with their Afghan counterparts to prepare for the modernization of the AAF, as the service transitions from Mi-17s to UH-60s. These are the first AAF UH-60s to arrive in country. 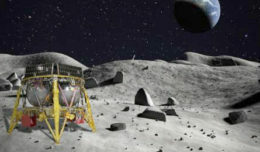 The planning involves seven different weapon systems, 14 different program offices and more than 20 major contracts. 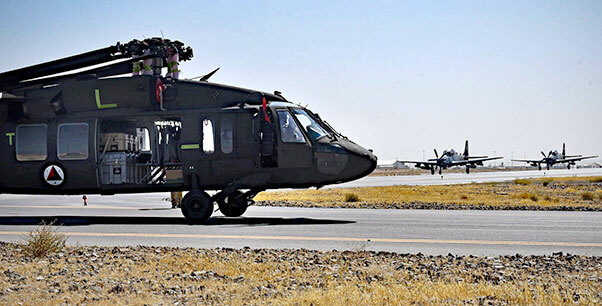 As the UH-60s arrive, contract maintenance experts will establish initial program stability, while Train, Advise, Assist Command-Air advisors conduct training classes and on-the-job training or Afghan pilots and maintainers. Once the Afghans aviators graduate and become mission ready, combat missions will be planned and conducted by AAF crews independent of coalition forces. The primary purpose of the UH-60 will be for troop and cargo transport, including casualty evacuation. However, in addition to the 61 base model UH-60s, the AAF will also receive 58 UH-60 models with fixed forward-fire capabilities. According to TAAC-Air advisors, these numbers are based on the final forecasted end strength, assuming no attrition.